A sales area is a combination of the Sales organization, distribution channel, and division. It defines the distribution of a sales organization in order to sell products by a certain division. By the way defining and assigning the sales organizations, distribution channel, and division, a sales area is not automatically formed and it has to be setup as a sales area. A sales area can belong to only one company code and assigning the sales organization to company code creates this relationship. Each sales and distribution document is assgined to exactly one sales area and this assignment cannot be changed. Various master data depending on the sales area, for example, customer master data, material master data, price, and discount. This system also carries out a number of checks concerning the validity of certain entries according to the sales area. Finally, the sales area is assigned to credit control area and then the sales office is assigned to sales area and the sales group to the sales office and an employee of a sales office can be assigned to sales group. The business area is a separate business unit for which internal reporting can be carried out. A company code may be divided into multiple business areas and a business area may also be shared by several company codes. A business area is not limited by the company codes. As such, for this reason, the business areas in all company codes must have the same description. A business area can be used to prepare balance sheets and profit and loss statement not only for company code but also for other internal areas like the ones which are related to division. 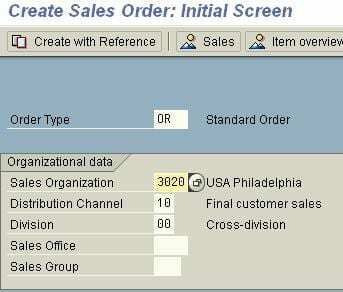 The relevant business area is determined for each order item according to the defined rule. It’s basically who delivers, who sells and who sell what? Business area assignment is done by the plan and the item division and the actual business area assignment is by sales area and the business area assignment is by sales organization, distribution channel and item division.